A team of Nebraska engineers is hoping its cell-stretching research will lead new understandings of how cells react to mechanical stimuli so that those expanded pathways might someday aid in fighting cancer and healing wounds. The three-year, $439,584 grant from the National Science Foundation will allow a team led by Ruiguo Yang and Jung Yul Lim to also work on understanding how linked individual cells communicate with each other as they respond to physical changes in their shared environment. Yang, assistant professor of mechanical and materials engineering, said the data they have shows the cells “can talk to each other,” and that there may be a mechanism that facilitates that communication. “We’re not sure how they do it, but they do talk. 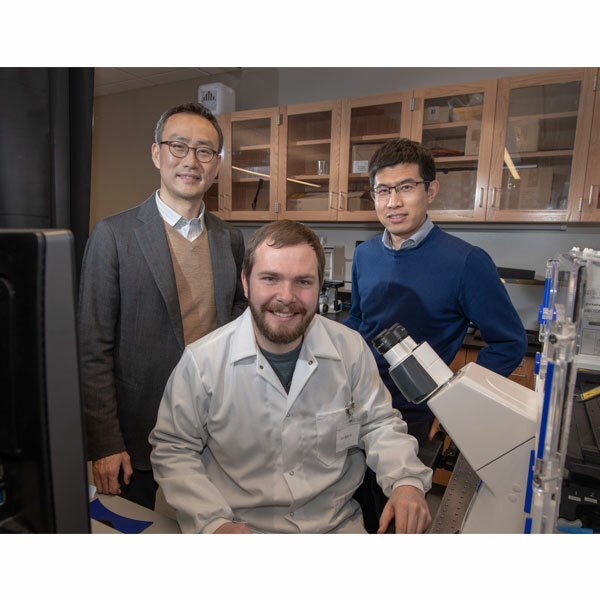 Finding that sensor that triggers everything, that sets off the chain reaction that results in cell migration, we are very eager to find out where it is, what it is, or even if there’s nothing there,” Yang said. The general field is mechanobiology, which is basically the understanding of biology from a mechanical or physical perspective, especially how physical forces and changes in the mechanical properties of cells and tissues contribute to their development, cell differentiation, physiology and diseases. Much of the work in that field – including research done by Lim, an associate professor of mechanical and materials engineering – has focused on how large groups of cells, especially in the form of a monolayer, react when they are strained, stretched or in some other way manipulated. This team is concerned with the cellular responses generated when those same mechanical inputs are applied to a linked pair of individual cells. These processes a cell goes through to create those responses is known as mechanotransduction, and understanding that could have implications to everyday medicine, Yang said. Yang said cancer and pemphigus vulgaris, a potentially fatal autoimmune disease that causes painful blistering on the skin and mucous membranes in humans, spread through the body and attack healthy tissues by breaking links between individual cells. Typically, scientists have sought ways to treat those types of diseases with an immunology approach. Yang said mechanobiological solutions, such as introducing drugs or cellular mutations that might protect those linkages, is a relatively new approach that offers hope. It could also speed the process of the body recovering from wounds or surgeries through fostering the cell migration that typically takes place in those instances. Yang said individual cells work as teammates as they navigate a path to the injured area to being the healing process, sort of like playing Follow the Leader.